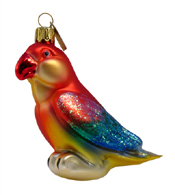 Tropical bird ornaments and decorations add a touch of the tropical rainforest to your holiday celebration. Breathtaking peacocks, exotic parrots, pink flamingos, vibrant toucans, and nautical pelicans are the perfect decorations for a tropical bird Christmas tree theme. Here you’ll find decorating tips for celebrating the holidays tropical style, as well as a variety of tropical bird ornaments and decorations for your home and Christmas tree. Bold exotic colors found in a tropical rainforest are perfect for this Christmas decoration theme. Choose a vibrant color palette that mirrors the hues of birds found in exotic locations. What type of garland should you choose for a tropical christmas theme? Silver or gold bead garland makes a beautiful accent to tropical ornaments. Drape your tree with ribbon in rainforest inspired colors or prints. Combine feathers, colorful ribbon, and shiny beads for a unique Christmas tree garland. The best Christmas light strands for decorating this tree are white, green, blue, or multicolored. Ornaments are available in a variety of species and materials (glass, wood, ceramic, and crystal to name a few). Consider adding ornaments that complement this theme: brightly colored glass bulbs, clear glass Christmas ornaments, crystal, beaded, or fused glass ornaments. Complete this Christmas tree theme with an elegant star tree topper. Add a tree skirt with vibrant rainforest colors or a tropical bird print.